Reading and share top 11 famous quotes and sayings about Success And Hard Work by famous authors and people. 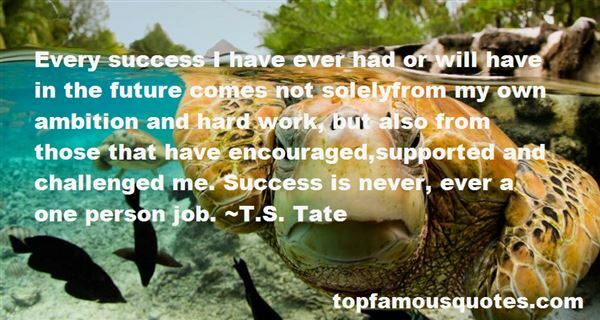 Browse top 11 famous quotes and sayings about Success And Hard Work by most favorite authors. 1. "Success depends in a very large measure upon individual initiative and exertion, and cannot be achieved except by a dint of hard work." 2. "We all naturally want to become successful... we also want to take shortcuts. And it's easy to do so, but you can never take away the effort of hard work and discipline and sacrifice." 3. "Our challenges may be new. The instruments with which we meet them may be new. But those values upon which our success depends - honesty and hard work, courage and fair play, tolerance and curiosity, loyalty and patriotism - these things are old. These things are true. They have been the quiet force of progress throughout our history. What is demanded then is a return to these truths. What is required of us now is a new era of responsibility - a recognition, on the part of every American, that we have duties to ourselves, our nation, and the world, duties that we do not grudgingly accept but rather seize gladly, firm in the knowledge that there is nothing so satisfying to the spirit, so defining of our character, than giving our all to a difficult task." 4. "The actor that taught me the most was Bernie Mac. I did my first big budget studio film with he and Angela Bassett, 'Mr. 3000' for Disney. 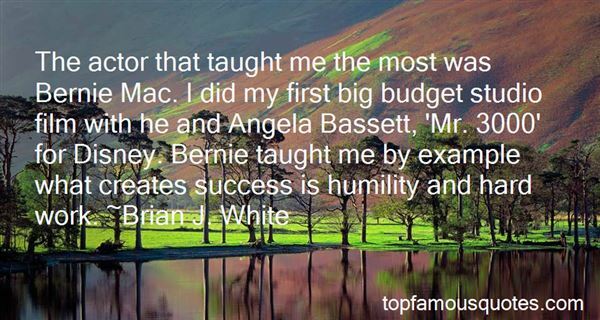 Bernie taught me by example what creates success is humility and hard work." 5. "The grim reality is that most start-ups fail. Most new products are not successful. Yet the story of perseverance, creative genius, and hard work persists." 6. "Thinking is free, planning is also free, but action taking is not free; you have a price to pay. Success is not luck; it demands work... hard work of course!" 7. "Success comes through determination and hard work and that "the fault … is not in our stars but in ourselves that we are underlings." 8. "The moment we believe that success is determined by an ingrained level of ability as opposed to resilience and hard work, we will be brittle in the face of adversity." 9. "I never expect appreciation. I always set a deadline for the things I have to do to be a successful person, when I complete them, I give myself a piece of candy, a glass of tea and some free time to enjoy- that is how I honor my hardworking and appreciate my struggles." 10. "To quote the exceptional teacher Marva Collins, "I will is more important than IQ." It is wonderful to have a terrific mind, but it's been my experience that having outstanding intelligence is a very small part of the total package that leads to success and happiness. Discipline, hard work, perserverance, and generosity of spirit are, in the final analysis, far more important." 11. "Every success I have ever had or will have in the future comes not solelyfrom my own ambition and hard work, but also from those that have encouraged,supported and challenged me. Success is never, ever a one person job." We remember, also, how that it is becoming increasingly difficult in these strenuous days for those who are desirous of studying the deeper things of God to find the time which such study requires."